Did you know that Portugal is one of the best European destinations for birdwatching? There is no other country in Europe where it is possible to see an Iberian imperial eagle or a blue wing pigeon, as well as more than 350 different bird species. Discover the birdwatching phenomenon and enjoy the best that nature has to offer. The large variety of natural habitats that can be found in Portugal allows any birdwatcher to discover many stunning territories: high mountains, natural parks, encased valleys, beaches as far as the eye can see, hills with views of the ocean, estuaries, vineyards and cork oak plantations, among others. The Portuguese seaside is also a stage for the migration of thousands of birds of dozens of species. Numerous marine and coastal birds (northern gannets, dowitchers, sandpipers, sea swallows, among others), birds of prey (eagles) and small birds (swallows, rock pipits, thrushes, nightingales, among others) cross Portuguese territory twice a year and that is why various distinct species can be found in all regions. For example, in the Tejo River’s estuary, which is located about 20 minutes from Lisbon, it is possible to observe 100 different bird species in only one day. This is a type of natural tourism that allows you to connect with yourself, as well as with nature. In order to partake in this type of adventure, you should make a reservation with a specialized company and be equipped with comfortable shoes and clothing, as well as a good pair of binoculars so that you don’t miss any of the colorful birds that may be hidden amidst the vegetation. The Peneda-Gerês National Park is a fantastic place located in northern Portugal. In this region, it is possible to experience various pedestrian trails such as the Calcedónia Trail, the Currais Trail and the Moinhos Trail, all of which will definitely make you forget your everyday problems. 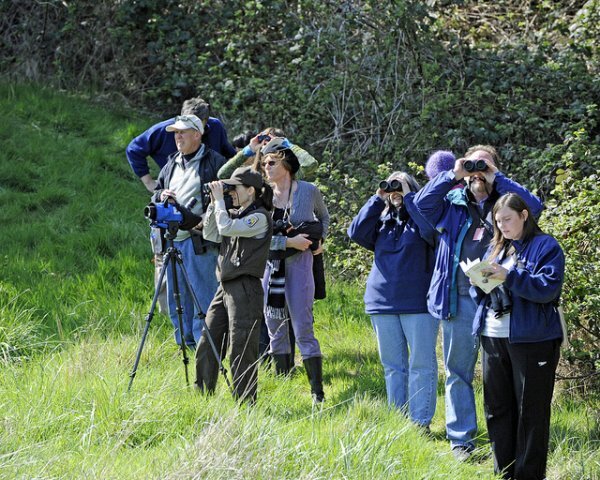 On the other hand, this is one of the most sought out locations for birdwatchers. Here it is possible to see the following species: short-toed eagle, peregrine falcon, pygmy owl, rock swallow, among others. The most popular places for birdwatching are: Planalto de Castro Laboreiro, Senhora da Peneda, Soajo, Lindoso, Gerês, Portela do Homem, Mata da Albergaria, Pitões da Júnias and Tourém. The Montesinho Natural Park is known for being a land of wolves and eagles. It has many brushwoods and mountain pastures, bedrocks and cliffs, as well as numerous mammals, reptiles and amphibians. Here you can find the following species: golden eagle, short-toed eagle, white stork, tawny pipit, blue rock thrush, black-eared wheatear, dartford warbler, among others. The best places for birdwatching are: Planalto da Moimenta, França, Montesinho, Lama Grande, Rio Sabor, Rio de Onor, Deilão, Guadramil, Rio Maçãs and Quintanilha. It is possible to take a cruise on the Douro river and appreciate the marvelous landscapes of Porto and northern Portugal, where the Egyptian vultures build their nests. The main bird species that can be found in the Douro region are: Egyptian vulture, griffon vulture, golden eagle, Bonelli's eagle, short-toed eagle, red kite, peregrine falcon, black stork, white stork, blue rock thrush, black-eared wheatear, among others. The best places for birdwatching are: Arzila, Lameira de Baixo and Casal das Amoreiras. The Azibo Reservoir is located in northeastern Portugal and is one of the best places for birdwatching. At this reservoir, it is possible to find a large variety of birds, the most popular being the Montagu Harrier, a magnificent bird that is well known for its acrobatic maneuvers. The Serra da Estrela Natural Park is one of Portugal’s most well known natural parks, as it combines the beauty of the mountains with the diversity of plants and animals. The main bird species that can be found there are: short-toed eagle, European honey buzzard, Montagu Harrier, black stork, pygmy owl, alpine swift, skylark, water blackbird, common rock thrush, blue rock thrush, bluethroat, kinglet, crow and ortolan. The most appropriate spots for birdwatching are: Torre and Planalto da Torre, Cântaro Magro, Rio Zêzere, Nave de Santo António and Manteigas. The Geopark Naturtejo is a territory with great tourism potential due to its numerous attractions, such as birdwatching. It is a region with a lot of vegetation, which attracts all types of birds. Here you’ll find black storks, imperial eagles, vultures and over 154 different bird species. Noudar Natural Park has a lot of vegetation and that attracts a large number of birds. Of the most popular, the highlight goes to the black vultures that are known for guarding the Noudar castle. The plains surrounding Castro Verde reveal a huge variety of bird species and that is why it is one of the best places in Portugal for birdwatching. One of Castro Verde’s biggest symbols is the bustard, the largest flying bird in Europe, which can weigh up to 16 kg and be the size of a turkey. This region’s main bird species include: white stork, griffon vulture, black vulture, Bonelli's eagle, golden eagle, red kite, bustard, little bustard, stone curlew, collared pratincole, red-rumped swallow, nightingale, red-chested cuckoo, grey shrike, woodchat shrike, crow and spanish sparrow. The most recommended spots for birdwatching are: Monte do Vale Gonçalinho, Barragem do Monte Gavião, Carregueiro, Barragem da Apariça, Ribeira do Cobres, São Marcos da Atabueira, Sra. de Aracelis, Monte de Belver, Monte do Guerreiro, Rolão and Piçarras. The Alentejo region is one of the most well known and appreciated areas for birdwatching. Here you’ll find all types of bird species, namely blue wing pigeons, eagles and falcons. The Algarve region is also a great destination for all birdwatchers. The Formosa Estuary and the Castro Marim Marsh are two humid zones that are very important for birdwatching, seeing as they are populated by exceptionally beautiful flamingos and herons, besides other rare species. The best locations for birdwatching are: Sapal de Venta Moinhos, Posto da Rocha, Salinas de Castro Marim, Salinas do Cerro do Bufo, Esteiro da Carrasqueira, Mata Nacional. The islands of Azores and Madeira, located in the Atlantic Ocean, are also an excellent option for birdwatchers. Here you’ll find birds that do not exist in every part of the world, such as the Zino's Petrel, the Madeira pigeon or the bullfinch. The best places for birdwatching are: Ponta do Pargo, Ponta de São Lourenço, on the deserted islands of the Madeira archipelago and the Pico da Vara on the island of São Miguel (Azores). Whichever place you choose for birdwatching, the fact is that you’ll always find surprising and marvelous landscapes and the most beautiful bird species you’ve ever imagined. In terms of accommodation, choose rural tourism so that you may be closer to these areas, can enjoy nature and surrender yourself to the charm of Portuguese hospitality. If you would like to visit a protected area such as a Natural Park, National Park or Natural Reservoir with an organized group, you must previously contact the Nature Conservation & Biodiversity Institute, in order to obtain authorization. On the other hand, if you plan on visiting private property, you should first contact the owner.